In honor of our most patriotic month of the year, I now present to you a most patriotic piece of music, popular in fireworks displays across America. The fact that it was written by a German guy who mostly lived in England makes it all the more interesting. George Frederic Handel was born in Germany, but he is more associated with England because he spent much of his career there. He experienced early success with operas and oratorios (big music concerts without costumes or sets, usually from Biblical texts). He wrote a little one called Messiah a few people have listened to once or twice (#wink). We talked about the Easter portion of Messiah back in April – head HERE for that post. 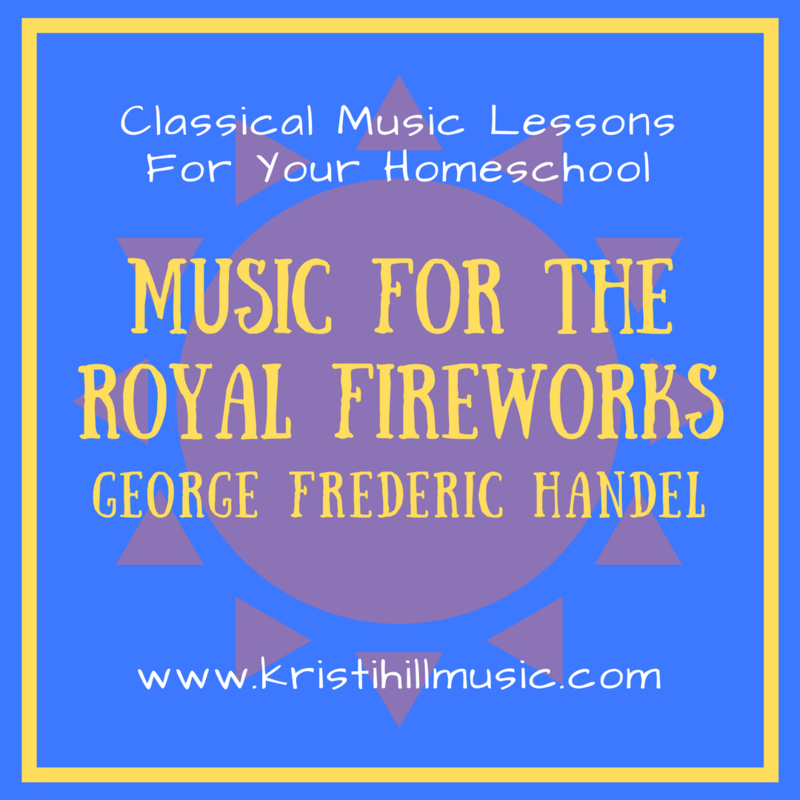 Handel premiered Music for the Royal Fireworks in 1749. One of his last hurrahs, it caused a certified riot in the streets of London. At that time, only the truly wealthy people ever heard live music. Regular, non-fancy people simply did not have access to instruments or events where instruments were played. The chance to hear live music outdoors – by one of the greatest composers that had ever lived – was an extraordinary opportunity. The entire city was excited to hit the streets and hear Handel’s new work. Horses and buggies crowded every thoroughfare, causing an epic traffic jam and shutting down those streets for hours. Music for the Royal Fireworks was originally composed to celebrate the signing of a military treaty, but it has since become associated with great patriotic moments around the world. ACTIVITY: I included this piece in my guide to Musical Sketching found HERE. I have played it many, many times over the years and seen children sketch parades, flags, celebrations, and – of course – fireworks. It’s great fun to see them sketch related topics without knowing anything about what the piece is about! Have fun teaching your kids about Germany/England’s musical gift to American patriotism! BTW, as the video wrapped up with the last of the fireworks’ explosions, a thunder clap sounded outside. God approves as well! Oh that’s awesome and fantastic!! I love it. Hope you had a great 4th of July.